SWFBUD was in the house tonight at the Howard Johnson Hotel in downtown Tampa where Mayor Bob Buckhorn spoke at the monthly Green Artery meeting. The Green Artery is a central Tampa movement to connect the green spaces with bike trails, bike lanes, sharrows and the mayor talked in glowing terms about the importance of connecting neighborhoods and these green spaces. Words are nice to hear but actions are the best, Bob. Let's make it happen. More Green Artery meetings will be held in other central Tampa neighbrohoods each month. The meeting drew more than 100 folks -- including city council members Yolie Capin, Lisa Montelione and Mike Suarez. My friends Myron and Lena have led the charge for the Green Artery, holding a meeting a month in a new central Tampa neighborhood. They have held about 10 with another nine or ten to go. Keep on plugging away Myron and Lena -- your efforts will pay off. So,I'm cycling south on Nebraska Avenue and see the usual salmon cyclists pedaling against traffic. Most of them usually don't drag a lawn mower along the way, though. Richard Gonzmart Introduces 3 Wines and a Tequila Named "Screaming Richard"
Tonight I had the chance to see the incomparable Richard Gonzmart, owner of Tampa's iconic Columbia Restaurant, unveil three new wines and a tequila named, "Screaming Richard," at a wonderful dinner that raised money for multiple causes. The Screaming Richard label is based on Richard's experience of participating in The Running of the Bulls in 2007. The label is a beauty -- it's a pic of Richard with a nearby bull that got some air play on the morning news shows. Richard is a former 4-Her who had a black angus as a kid, so Richard wanted to help the bull up. Richard also introduced three RG wines, including telling the amazing story behind a red wine unveiled to honor Rusty, his beloved German shepherd. Richard said Rusty fell ill and suffered from a near-fatal disease, but he took his four-legged pal to a University of Florida small animal hospital, where Rusty got some medication and he's still alive. Richard loves raising German shepherds, but he said Rusty was the best ever. Here's Richard talking about Rusty tonight. The Columbia also just introduced a new menu packed with cool stories, great new dishes and its signature items. 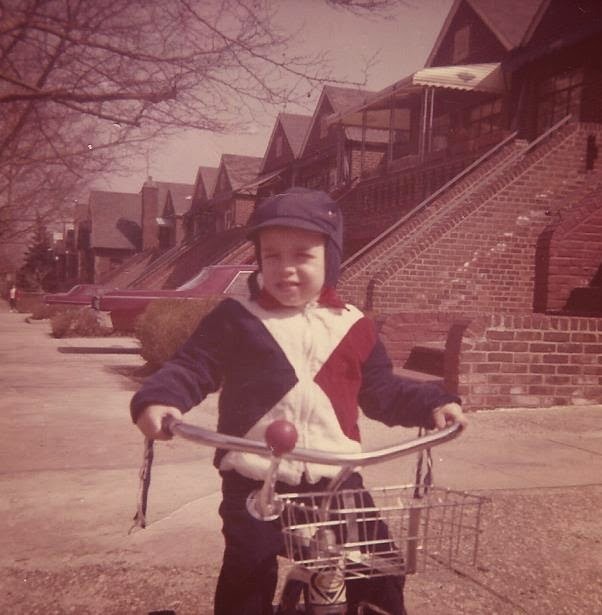 Richard also loves bicycling, so I hope he can attend the Bicycle Bash on NOV 6. SWFBUD has urged the city of Tampa to re-pave Bayshore Boulevard and stripe bike lanes for years and we welcome the city on doing the job now. WMNF radio in Tampa did a cool report on the Bayshore project. These are just a few of the Share the Rpad signs and sharrows on North Boulevard heading north as you approach MLK Blvd. in Tampa. Tampa has come come a long way since seven years ago when I called the city's public works office and I asked for a Share the Road sign on Rowlett Park Srive. At the time, I was told the city could not post a Share the Road sign because it costs too much to maintain. Now check all these sharrows and accompanying Share the Road signs on this small stretch alone. Well done here, city of Tampa -- keep them coming. You never know who will meet on a bicycle on the roads around here. 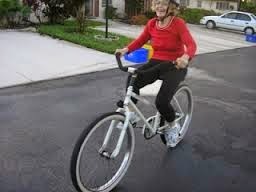 Like big Ron Swiger, whimsical Mimi and a host of thers Seminole Heights Bicycle Club folks returning from Davis Islands. I met up with them coming back from the 3 Bridges Ride. Few areas of the country have both so many bicyclists and motorists who are unaware about driving their vehicles and sharing the road together safely AND so many YEAR_ROUND cool ares to cycle such as the hills of the San Antonio/Dade City area and the Bay. This morning at 7:15 am, I was cycling on Hillsborough Avenue as part of a ride to bike over the Courtney Campbell Causeway and I counted no less than 3 salmon cyclists coming at me in the bike lane in 10 minutes. Here's one of those bicyclists biking against traffic. On the way home, I crested the Courtney Campbell Causeway span on the way to Tampa and biking over water is a wonderful experience. The DOT is scheduled to build a separate causeway span as part of a trail that will provide access for a wider group of cyclists and pedestrians. 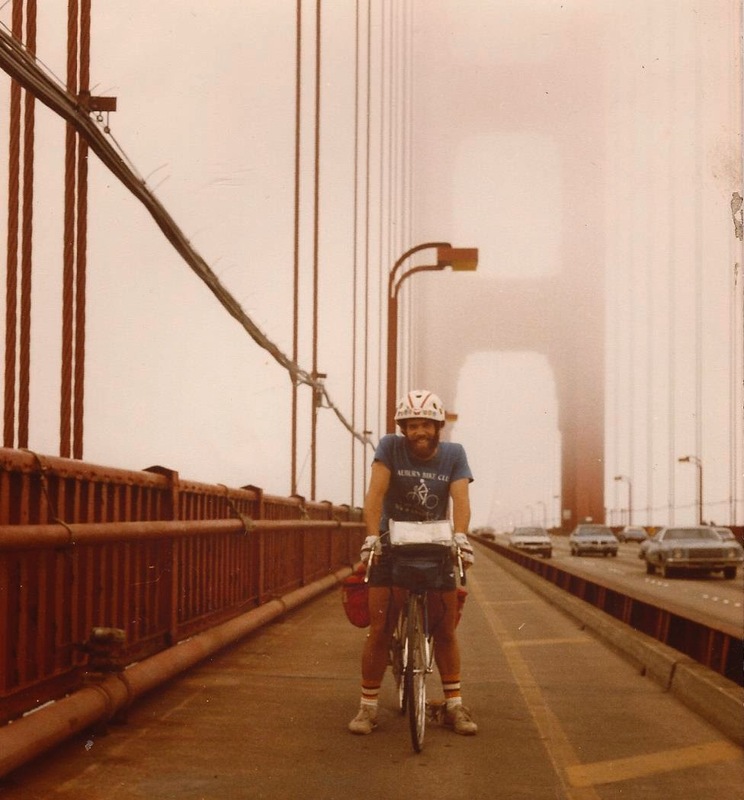 Right now, it's a rare bicyclist who crosses the causeway because of the narrow shoulder on the main bridge and also speeding cars that routinely go 65 mph and faster across the causeway. -- On Aug. 18, two St. Pete bicyclists were shot by people in a car with BB guns while biking on the 5 PM ride in St. Petersburg: "If you can offer ANY info on the car, the tag # or of the driver or passenger of the car who shot two of the bicyclists with a BB gun, please do whatever you can to help the SPPD investigate this case by contacting Officer Philip Postle at 727-893-7780. The case number is 2011-50903. The police have bumped the charge up to a felony," Mel Lucas said. -- On Aug. 17, my Facebook friend Casey tells of the following story -- "One of my co-workers got assaulted by some charming pre-tweens in Tampa while riding her bike home after work two days ago. They pushed her off her bike and took off. Not three blocks from a police station no less. She is now armed with pepper spray, but jeez, these kids evidently have nothing better to do with their time than scaring and hurting people just for fun." -- Two weeks ago, my bicycle friend Alan told me a motorist tried to jump the curb and run him over while he biked on his mountain bike on a sidewalk. -- And my friends Rick and Nick and I were cycling early Saturday morning on Swann Avenue in south Tampa when a woman in a Jeep Cherokee SUV honked her horn from a quarter-mile back and came within inches of striking us when she passed, flagrantly violating the law that requires motorists to pass a bicyclist by a minimum berth of three feet. Folks, the fact is we live in an area where a disturbingly high number of motorists and people endanger bicyclists through downright mean and dangerous criuminal acts and uneducated, inattentive or aggressive driving. Be vigilant about your safety on the road. If you can, document any illegal behavior directed toward you and report all incidents to police. Mel Lucas, a St. Petersburg cyclist, says two bike riders were shot with BB guns on a Thursday night 5 PM ride. Please help St. Petersburg Police catch the BB gun shooters. 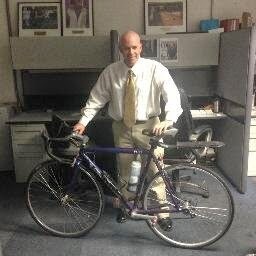 Bicyclists who were on the 5:00 ride in St. Petersburg lastnight (8/18/11): If you can offer ANY info on the car, the tag # or of the driver or passenger of the car who shot two of the bicyclists with a BB gun, please do whatever you can to help the SPPD investigate this case by contacting Officer Philip Postle at 893-7780. The case number is 2011-50903. The police have bumped the charge up to a felony. Unless we do what we can to prosecute this type of thing, we will continue to be victims while out cycling. It's your choice. When you ride a bicycle you get a close unfettered look at behavior on the roadways -- and here's a good example. This Tampa International Airport police officer stopped to check this car that's carrying just a few pipes. The car was parked on the side of Hillsborough Avenue along TIA land. 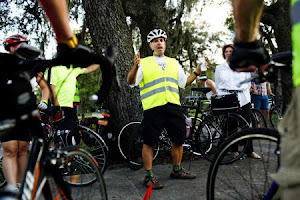 Would you like to volunteer at the 2011 SWFBUD Bicycle Bash festival on Nov. 6 at Flatwoods? You will have a great time and get a free Polar Bottle to boot. Contact Alansnel@yahoo.com to get involved. I see bicyclists with trailers all the time. Check out this guy on 40th Street heading south in Tampa. So, I'm cycling on 46th Street south from Fowler Avenue south and I pass the county's Medical Examiner's office. Check out the sign across the street from the ME's building. Bike racks take over space on state road in Orlando. Hey, at Cafe Hey, they'll take 10 percent off your bill if your ride your bicycle to the pleasant cafe. When I get my early-morning cycling in -- cycling to Flatwoods, doing a loop and heading home -- it guarantees the day will end a success. 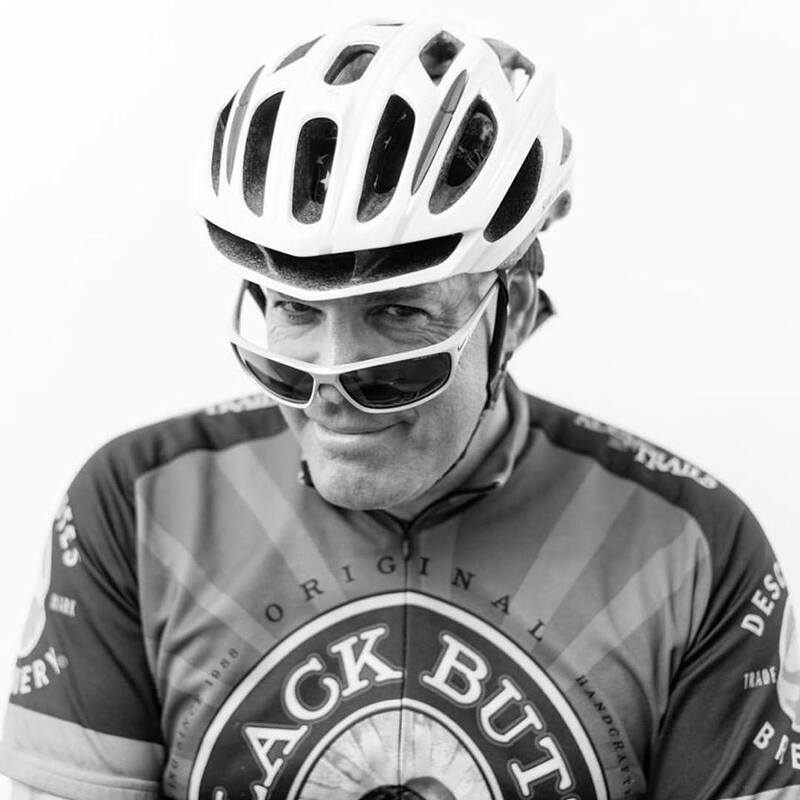 Bicycling Magazine has a lot of cool techie stories, but I like its everyman bicycle stories the best. Witness: This is a wonderful read. This will put a smile on your face. When in Vilnius, don't park your car in the bike lane: Because this is what happens. What Do You Think About Bike Boxes? Several cities around the country have instituted bike boxes, including San Francisco, which has more than a half-dozen bike boxes. Let's bike with Nick and Ellen along the frontage road on the Courtney Campbell Causeway between Clearwater and Tampa. Great ride Sunday morning. Look at this incredible cycling access to the Bay. Also, SWFBUD supports the Florida DOT building a Courtney Campbell Bridge trail, including a new bicycle-pedestrian bridge alongside the high span on the Tampa side of the causeway. Check out what it's like to bike the high bridge now -- the shoulder is a mere four feet wide. I have lived in metro New York City; upstate New York; Ann Arbor, Michigan; South Florida; Denver; and metro Seattle. And nowhere have I lived in an area where motorists scream at me to get off the road while I'm cycling more often as the drivers in the Tampa Bay area. Quite simply, a disturbing high number of motorists in the Tampa Bay area are not educated to understand that bicycles are vehicles and have a right to bike in the road. About three weeks ago, I was cycling single file with my bike pals Nick and Rick on Swann Avenue in Tampa heading west just west of the McDill Avenue intersection when the three of us heard a motorist blaring her car horn from a quarter-mile behind. She continued to honk her horn loudly as she got closer and closer and proceeded to pass all three of us by mere inches. It was a frighening episode. We caught up with the driver in the black Jeep Cherokee at a traffic signal at Manhattan Avenue and I snapped a photo of the tag number for ID purposes. Later that day, I contacted Tampa Police about this incident and later that week a police corporal interviewed the woman driver about the case. The corporal told me the driver was not aware that motorists are required by law to pass a bicyclist by a minimum berth of three feet in Florida and the driver told the officer that she thought all bicyclists should be biking on "pathways" in Tampa. But the officer said her investigation concluded that the driver did not try to intentionally strike us. That's why the driver was not charged with any violation. But the driver was given a stern lecture by the officer about a bicyclist's right to the road and that motorists must pass cyclists by a minimum space of three feet. Today, I received a disturbing email from a bicyclist friend who said he was biking a road in Tampa today when a driver blared his horn and nearly hit him with his side mirror while passing him. Then this happened: "After this person passed us, he then abruptly slammed on his brakes with the intention of having us run into his vehicle from behind." My friend said he caught up with the driver and they exchanged words, with the driver yelling that cyclists should be on the sidewalk and that roads are for cars. My friend said he was biking away on his mountain bike on the sidewalk when the driver attempted to drive onto the sidewalk in an attempt to strike him. I do not know whether my friend got a tag number or reported this incident. 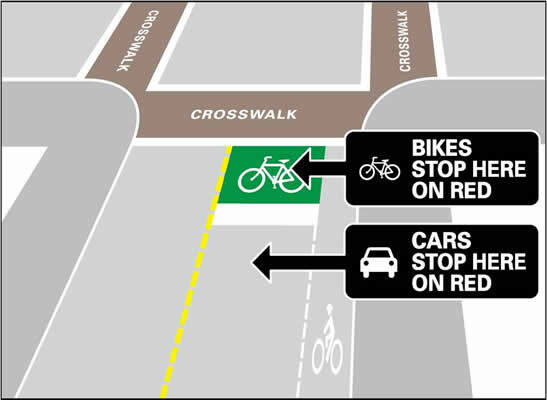 Here are my suggestions regarding confrontational situations when motorists nearly strike bicyclists. 2. Only if you feel safe enough, use your cell phone to take a photo of the driver for ID purposes. 3. NEVER NEVER touch the motorist's vehicle. 4. Report the incident with local police. It's vital to get the case on the record and launch an investigation. If you bike on the roads in the Tampa Bay area, I'm sure you have faced a situation where a motorist was hostile to you by blaring his or her car horn or screaming at you to get off the road. In my friend's case today, he said the driver tred to hit him. Emotions run high under these scenarios. Try to stay as calm as possible while making sure you get the tag number and even a photo of the vehicle. When a HART bus nearly sideswiped me a year and a half ago, I caught up with the driver at a red light, circled his vehicle and snapped a photo of the driver through the windshield from the sidewalk. HART investigated the matter and determined the bus driver was wrong for nearly hitting me and HART proceeded to put 3-foot signs on its buses and became a sponsor of the Bicycle Bash to improve bicycle awareness. If you want to report a case in Tampa where a motorist nearly struck you or acted in a manner in which the driver tried to hit you, get a tag number and driver ID and contact Tampa Police. If it's not real-time and you're back at your home after the incident, call Tampa Police at its non-emergency number st 813-231-6130. Stay safe out there. The roads are for everyone and bicyclists and motorists alike must obey the law to share the road safely. This morning, the amazing Margaret greeted bicyclists in Seminole Heights with her bicyclist cowbell during the Seminole Heights Bicycle Club Neighborhood Ride. Margaret is recovering from an ankle injury and she can't ride her bike but she can sound the cowbell when bicyclist pass her home. Here's why bicycling in Seminole Heights is so special -- the early-morning light plus the wonderful tree canopy. This morning SWFBUD appeared before the Metropolitan Planning Organization board to unveil its proposed BAM Network -- the unified multi-trail system that would cover most ofHillsborough County and Tampa. BAM stands for Bicycle Area Mobility and SWFBUD believes connecting the Tampa Bypass Canal Trail, the South Coast Greenway and the Selmon Expressway Greenway into one unified trail system would offer bicyclists a safe and efficient way to get around while also interconnecting with bus routes and surface streets with bike lanes. Our message to the MPO board and elected officials: Ride The BAM! SWFBUD asked that the MPO board recommend funding a regional BAM Network and get the city of Tampa and Hillsborough County to partner in building the BAM. Here's a great stat: Portland, Oregon built 360 miles of bike trails and bike lanes for the cost of a single mile of highway construction. This man serves on several Ybor City business committees and urged the MPO board to recommend funding the Selmon Expressway Greenway as a vital link between downtown Tampa and Ybor City. Thank you Kathy D'Onofrio of state Rep. Janet Cruz for speaking on behalf of the funding of the Tampa Bypass Canal Trail. Rep, Cruz has been a terrific supporter of bicycling in Tampa Bay.The Bypass Canal Trail would connect New Tampa to State Road 60 and be one leg of the BAM Network. This woman asked the MPO board why the Selmon Expressway Greenway is not being funded after she told the board she was buzzed by motorists when she rode her bicycle on the road in Tampa. I will be teaming up with famed glass artist Susan Gott of the Phoenix Studio to put on an artist and antiques bicycle tour ride in Seminole Heights on Oct. 22. The ride will start and finish at Susan's glass art studio off Nebraska Avenue, about a half-mile north of Hanna Avenue. Susan has lined up three antique shops and several artists for this bicycle tour.